The absolutely amazing people over at TG Green Teas were kind enough to send me some of their amazing hot and cold teas to try out and review for you guys! Of course I wasn’t going to say no to doing this because I always like to let you guys know about new teas I come across. As you all know I would never work with a brand that I didn’t love, every product / brand I feature on this blog is truly loved by me and no false / payed for opinions will ever be featured. Green Tea Tea Bags! In three different blends : Green Tea with Jujube and Osmanthus , Original Green Tea, and Green Tea with Ginger and Lemon Zest. There are 15 Tea Bags in each resealable pouch which are currently priced at £3.79! Which I think is an incredibly reasonable priced the the high quality of the tea you receive. My favourite blend out of these three has to be the green tea with ginger and lemon zest. This is such a well rounded flavoursome fruity blend with a naturally uplifting boost. I’ve been having the lemon zest and ginger green tea in the mornings and it’s a great wake me up for those days when you just can’t get going. It’s great such a soft, clean and crisp taste that your body will love you for. 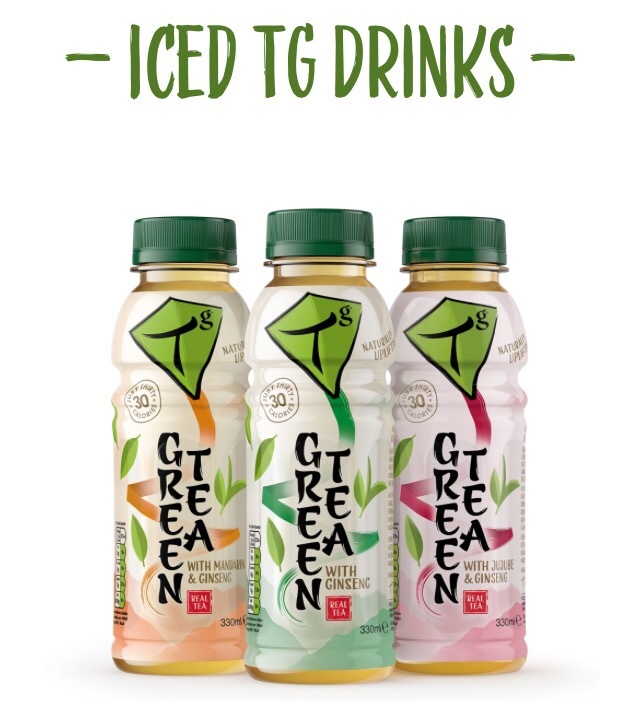 The TG iced teas which also come in three different super tasty flavours : Green Tea with Mandarin and Ginseng , Green Tea with Ginseng and Green Tea with Jujube and Ginseng. These teas are currently priced at £1.39 which is again incredibly reasonable for such high quality tea. They are also only 30 calories a bottle! My favourite of the ice tea has to be the Green Tea with Mandarin. I’m a huge fan of fruity flavours so I knew before even trying this one that I was going to love it above the rest. That’s not to say that the other two are tasty in their own right but the fruity edition really stood out to me a lot more. I would advise making sure to chill these before you drink them, to fully take advantage of how refreshing these blends can be. I’m hosting a giveaway through twitter in collaboration with TG Green Teas! To be in with a chance of winning this tea-riffic green tea bundle. Which includes all of the products I’ve mentioned in this post, as well as an exclusive TG Green Teas travel cup. Head over to twitter and follow both me (@teaisawishkim) and TG Green Teas (@DrinkTg) and retweet my pinned giveaway tweet. As soon as I read the list of teas the ginger and lemon one stood out so I’m glad to hear it’s your favourite too! I’d love to try it! I’ve never had an iced tea before so I’m intrigued by those bottles! Great post, I’ll be sure to enter the giveaway! I am such a huge lover of green tea so I was excited to see this post come up in the TeaCupClub meeting today! The packaging looks so cool and the fruity blends make is look so much more appetising! Great read! All I drink is tea and these sound so fantastic! I love green teas but the mandarin flavor sound brilliant! Hi, I was lucky to receive their teas to review and really enjoyed them. I’m sure this giveaway will prove to be very popular, Chloe. As a green tea enthusiast i’m excited to see iced green tea! Love these kinds of tea! Most Defo entering, thanks you for sharing and the opportunity! I LOVE mandarin, so that iced tea sounds RIGHT up my street, as well as the ginger and lemon!